April 28, 2011: One day, perhaps billions of years from now, aliens might be surprised to run across an old spaceship from Earth. Far from home, the ancient probe is cold, its nuclear power source spent long ago; an iconic white antenna points silently into the void, beaming no data to the species that made it. Yet this Voyager may speak to its finders. 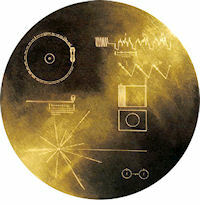 A golden record is fixed to the side of the probe. If ET can decipher it, he might be surprised again, because Voyager has a story to tell—and it's a Love Story. Jimmy Carter was president, Star Wars was the top-grossing film, and NASA was preparing to launch the two Voyager probes to the outer planets. Like Pioneer 10 and 11 before them, Voyager 1 and 2 would fly by the gas giants and, after a frenzy of data-taking, slingshot out of the solar system. These spacecraft were to become interstellar ambassadors. Less than 9 months before launch, Carl Sagan was asked by NASA personnel to assemble "some message for a possible extraterrestrial civilization." Later, one member of Sagan's small team would describe the process as "a fire drill" with nothing less at stake than First Contact itself. "The chances of aliens finding the Voyagers in the vast emptiness of space are small—some say infinitesimal—but we took our jobs seriously," recalls team member Ann Druyan. "From the moment when Carl first broached the project to Tim Ferris and me, it felt mythic." Voyager would carry a selection of Earth's greatest music, a photo gallery of our planet and its inhabitants, and an audio essay of terrestrial sounds, both natural and technological. But how would this information be conveyed? A popular technology in the 1970s was the 8-track tape. That would never do. For one thing, what would ET think? Moreover, magnetic tape is susceptible to degradation by space radiation and magnetic fields. A message recorded on such a medium would decay long before it was found. Radio astronomer Frank Drake, who became a key member of Sagan's team, suggested a phonograph record. Extraterrestrials would stand a good chance of figuring out how to play back such an old-school technology—and phonograph records were tough. By one estimate, the etchings on a suitably-shielded metallic phonograph record could last for hundreds of millions of years in interstellar space, eroded mainly by a slow drizzle of micrometeoroid impacts. A copper record coated in gold would satisfy the thermal and magnetic requirements of the Voyager probes. Click to view a video about Voyager and the Golden Record. "Eventually we decided on having the record designed for 16 2/3 revolutions per minute," wrote Sagan. This was half the speed of a conventional 33 1/3 platter. "[There would be] some loss in fidelity but not, we believe, an extremely severe loss, especially if the recipients were as clever as they would have to be to acquire the record in the first place." Choosing the contents of the record was a heady and agonizing process. Even with the stepped-down spin rate, there was only enough room for about 90 minutes of music and a hundred or so images. "I remember sitting around the kitchen table making these huge decisions about what to put on and what to leave off," recalls Druyan. "We couldn't help but appreciate the enormous responsibility to create a cultural Noah's Ark with a shelf life of hundreds of millions of years." In their book, Murmurs of Earth, Sagan et al describe the decision-making process. Much of the challenge was intellectual—e.g., how to cover the complete geographical, historical, and cultural variety of the world’s music in 90 minutes or less. Among Western music, Beethoven's 5th and Chuck Berry's Johnny B. Goode made the cut; selections from Jefferson Starship did not. Some challenges were legal: The Beatles' Here Comes the Sun could not be sent because the Fab Four, who unanimously wished their work sent to the stars, did not hold the copyright to their own song. Other challenges were bureaucratic. In one of many anecdotes that illuminate the human condition as well as anything on the Golden Record, Sagan describes the tortuous process of obtaining permission for a number of UN delegates to simply say "Hello." Ultimately, it couldn't be done, and Sagan appealed to the foreign language departments of Cornell University, where professors and students were eager to help. Thus a representative set of short greetings was assembled, beginning with Sumerian, one of the oldest known languages, and ending with a greeting from an American five-year old: "Hello from the children of planet Earth." When all was said and done, Voyager blasted off with 118 photographs; 90 minutes of music; greetings in 55 human languages and one whale language; an audio essay featuring everything from burbling mud pots to barking dogs to a roaring Saturn 5 liftoff; a remarkably poetic salutation from the Secretary General of the United Nations; and the brain waves of a young women in love. Of all the selections on the record, it is the latter which might pique ET's interest most. It certainly has this effect on human listeners. Just how do you stumble upon a woman in love and record her brain waves for an interstellar message? It helps when the young woman is herself a member of the recording team: Ann Druyan. A sampling of Ann Druyan's brain waves, recorded on June 3, 1977. "I had this idea," recalls Druyan, "that we should put someone's EEG on the record. We know that EEG patterns register some changes in thought. Would it be possible, I wondered, for a highly advanced technology of several million years from now to actually decipher human thoughts?" Sagan and the others liked the idea, and volunteered Druyan to provide the brain waves. "I contacted Dr. Julius Korein of the New York University Medical Center, and with Tim Ferris's help we set up an hour-long recording session for my innermost self." The EEG was scheduled for June 3, 1977. Druyan prepared a script to guide her thoughts—"a mental itinerary of the ideas and individuals of history whose memory I hoped to perpetuate." She could not prepare, however, for what happened two days before the scheduled recording. "On June 1, 1977, Carl and I shared a wonderfully important phone call," she recalls. Without the aid of a date or even a romantic moment alone, the two had fallen in love during the mad rush to complete the Golden Record. "We decided to get married. It was a Eureka! moment for both of us—the idea that we could find the perfect match. It was a discovery that has been reaffirmed in countless ways since." Echoes of that moment reverberated through her mind during the recording session. Her conscious mind may have been reciting culture and philosophy, but her subconscious was buzzing with the euphoria of the Great Idea of True Love. The hour was electronically compressed to a single minute that sounds, appropriately, like a string of exploding firecrackers. "My feelings as a 27 year old woman, madly fallen in love, they're on that record,” says Druyan. "It's forever. It'll be true 100 million years from now. For me Voyager is a kind of joy so powerful, it robs you of your fear of death." If aliens ever do find one of the Voyagers and decipher its contents, they will briefly meet dozens of musicians, artists, whales, dogs, crickets, engineers, and common working people. But the only one who they might have a chance to truly get to know is that young woman—not a bad choice. It has been pointed out that the most probable finders of Voyager will be … us. Eventually, technology may allow humans to overtake and recover the distant probes. In that case, they will be reduced to mere time capsules from the year 1977. Arthur C. Clarke recognized this possibility and suggested adding a note to the Golden Record: "Please leave me alone; let me go on to the stars." Because Voyager has a story to tell. 1. 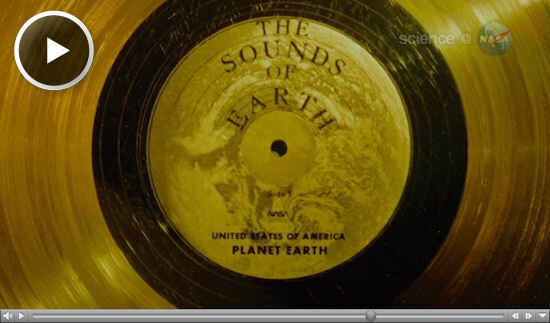 The team that assembled the Golden Record was led by Carl Sagan and included Frank Drake, Ann Druyan, Timothy Ferris, Jon Lomberg, and Linda Salzman Sagan. 2. The book Murmurs of Earth by Sagan et al is out of print but may be found from many used booksellers online. 3. The Voyager Golden Record is available in CD form, entitled Murmurs of Earth. Like the book of the same name, the CD is out of print but readily available from private sellers on the Internet. The author (TP) recommends listening to the CD once without scanning the table of contents from the record jacket. The unfamiliarity of some of the tracks may make you feel like an alien on your own planet. 4. Don't forget Pioneer: Pioneers 10 and 11 carried the first message to the stars. "Affixed to one of the antenna support struts of each spacecraft is a 6 x 9 inch gold-coated aluminum plaque on which is etched a drawing that describes something of the epoch and locale of human civilization, circa the 1970s, portrayed in a scientific language that other technological civilizations might understand. The plaque also contains a sketch of two representatives of the human species greeting the cosmos with hope," Sagan wrote in Murmurs of Earth. The Voyagers were faster spacecraft, and they would eventually overtake the Pioneers (already launched in the early 1970s). Sagan's team wanted the Voyager message to be an improvement, too—not just a few simple sketches and a wave hello.